All of these words are probably familiar to you but each should be considered individually when thinking about your roof and when to replace or repair it. Guttering is one of the most noticeable parts of your houses when looking at it at ground level. If your guttering is rusty or falling off it affects the whole look of your building making it seem unkept. The rest of your house may be very well maintained but if your guttering is in poor condition your whole house will look aged and in need of repair. It is amazing what difference a new gutter can make to a house not just visually but also to the water tightness of your building. A failing gutter lets water pour back into your ceiling as well as allowing water to fall from the roof anywhere it wants to. Guttering comes in many colours and profiles to suit your house and colour scheme. 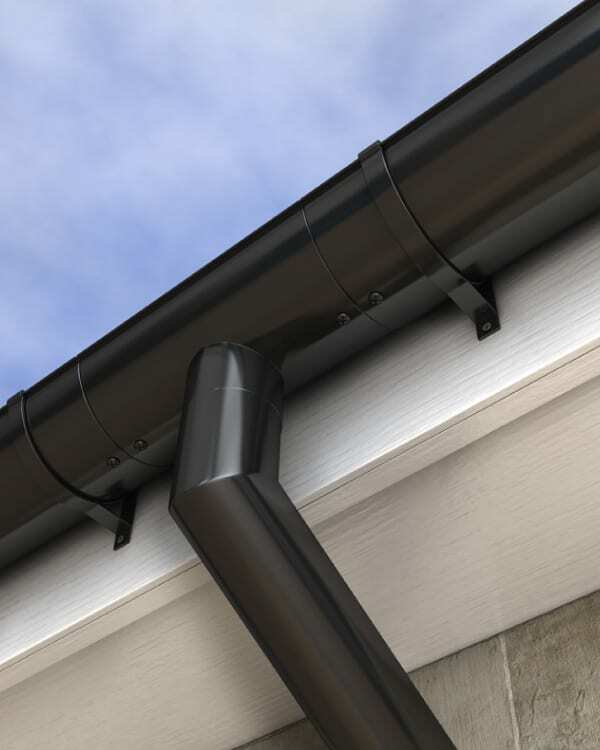 At Sydney Roof, we can advise you on the guttering that is the correct profile for your house as well as advise you on colours. Don’t forget you may have Box guttering on your roof which you cannot see. If organizing a gutter inspection make sure all of the guttering is inspected not just the piece you can see is damaged. Although connected to the guttering is a system in its own right. The purpose of the down pipe is to take the water away from the roof and either direct it to a tank or to dispose of it through the storm water system connected to your home. Downpipes can get blocked full of leaves, debris or even a tennis ball that has been thrown onto the roof or it can come away from the gutter, they can rust out if made of metal, they can look very unsightly if installed incorrectly or in the wrong place. Sometimes the cause of an overflowing gutter can be not enough down pipes being fitted in the first place. Sydney Roof has the expertise to know where the placement of the downpipes is needed to gain the maximum advantage of water control even in the heaviest of storms. Inspecting your downpipes should be part of your maintenance schedule, they are easily seen from ground level. If they need attention you should schedule a meeting with a roofing company to decide what your best way forward would be. The valley tray is the large piece of metal tray laying on your roof to catch the water between the valleys. This tray can rust out or become dislodged during the lifetime of your roof and may need replacing. This is a problem you should not ignore. The failure of the Valley tray can lead to water entering your home in large quantities. They are designed to carry a lot of water and when installed properly are a major part of the integrity of your roof. Unfortunately, many homeowners ignore the rusting look of their valley tray but as soon as the rust breaks through you have water pouring into your ceiling. As with all roofing work Sydney Roof can replace you Valley in a timely and efficient manner with very little disruption to you and your family or workplace. If you are the owner of a house with a tile roof then you probably have ridge capping and pointing. Over time the pointing can crack or become dislodged allowing ridge capping to become loose or to be completely blown off the roof. This then allows roof tiles to become dislodged and possibly blown off your roof also. Slipping ridges can be a hazard to those below if they slip right off of the roof. It doesn’t take a lot to bring them down once they are loose. Astatically a roof with their ridges repointed looks neat and clean as opposed to the cement being in pieces and parts missing. But it’s not all about looks. Repointing can extend the life of your roof and help keep it watertight for years to come. At Sydney Roof we can take care of your new bedding and pointing, helping with both the looks, water tightness and safety of your tiled roof. Part of keeping your home in great shape means taking great care to ensure your roof is safe, healthy and without any damage. Even small cracks that could look unimportant could develop into serious issues if left unattended for long lengths of time. Any healthy roof has healthy gutters and downpipes. Whilst roofs and guttering are designed to stand the test of time, they can take a heavy beating, and often materials that were never designed for a gutter can get lodged and cause short-term and long-term damage. Serious roof damage – gutters are designed to capture run-on water from the roof’s slope during rain or even daily condensation. If this water is not able to clearly flow down the gutters to its release via the downpipes, your roof is put in danger. Constant contact with water by materials in your roof such as wood can lead to damage like rot, which has a carry-on effect to the structural integrity of your roof. If this occurs, it’s only a matter of time before this material in the roof will need to be replaced, which will be a far more costly exercise than properly unclogging the gutter in the first place. Damage to fascia’s – A fascia gutter is a kind of gutter that combines the gutter itself and the wood fascia into one. Even if you don’t have a fascia gutter, you will have a fascia board, which acts as a cap on the end of rafters and works to support the roof frame. These fascia boards are quite often made from wood. If your gutters are clogged or damaged and water is not able to run off in the direction it was designed to, these boards will begin to suffer great damage, first deteriorating before moving on to rotting. This can lead to a very expensive fix in order to get your roof back in working order, and if you live in an older home with original design features in the fascia, some of the home’s beauty and charm will be lost as you’ll be required to replace these with more updated and modern versions. Damage to surrounding landscape – many people put a lot of effort into the landscaping that surrounds their home, to ensure garden beds are neat and full of beautifully flowering plants and shrubs. If your gutter is clogged and the clog is causing excess water to gather before spilling over the side, this water can land in your flowerbeds or gardens, and too much of this over time could lead to their death. This can also lead to added expenses, as these plants will require replacing. It’s much simpler to address the problem in your gutters before it reaches this level of damage rather than letting the problem run its course and having additional damage as collateral throughout your backyard. Ice damming – if your home is in a colder climate (and let’s face it, Sydney winters can indeed get chilly! ), there’s the possibility of ice dams forming. Whilst this can occur even with a clean gutter if your gutters are clogged, water is prevented from draining, which leads to an increased risk of these ice dams taking place. Once an ice dam occurs, the water can begin to seep into your home, which leads to an increased risk of further damage to either your electrical wiring or to your home’s structural integrity. This can also lead to mold growing in the walls as the result of wet materials left over the course of time, and mold has serious health consequences for adults and children alike. It’s best not to risk it! Just like with any other part of your home, your roof and the systems that keep it in working order are an important investment into your financial and physical security, safety and wellbeing. If there are any issues with any part of your roof, including your gutters and downpipes, it’s best to address the problem as soon as you’re aware of it, in order to stop any further damage from taking place and to keep the cost of repair to a minimum. If you try to repair your guttering and downpipes on your own, you’ll find yourself in for a difficult and potentially impossible job. They’re in a tough location to reach and proper care and repair requires the work of someone who’s highly trained and has years of extensive experience behind them. You’ll also find a gutter repair expert comes with the specific jobs and tools required to get the work done, rather than the result you’d have if you tried to rustle up the tools needed from your shed and from what’s on hand. This is one area of life where it’s best to leave the work to the professionals. So, do your research so you can ensure you hire someone who’s trustworthy, and then sit back with a cup of tea whilst your gutters get the professional treatment they deserve and your roof is restored to perfect working conditions. Even if you don’t have any dramatic damage to your gutters, it’s important to treat them to an (at least) annual maintenance check to ensure everything is in working order. By hiring a Sydney roofing and gutters repair professional, you can rest assured that any damage is being addressed and any potential future problems are unearthed and treated. The roofing professional will inspect all gutters and downpipes to check for damage and blockages. If found, any damage can be quoted on for further repair. They’ll also carry out a thorough clean of your gutters and downpipes so that any leaf buildups, debris or misplaced toys are removed and the gutters are kept clear so water can flow without blockage. Your Sydney roof repair professional will also check on the current condition of your gutters and downpipes, looking for any sign of corrosion, damage, or rusting. If these conditions are spotted before they can really break down, a larger repair cost can be saved by identifying a future problem and replacing or treating where needed to ensure your roof’s health and the maximum functionality of your guttering. If upon diagnosis, it’s evident that part (or all) of your gutters and downpipes need replacing, your roof repair professional will be well equipped to quote you on this work and carry the job out effectively. All architectural styles of homes are catered for, as experienced professionals are familiar with the right materials to purchase in order to keep with the home’s architectural design and styling. You’ll also be able to discuss with them the range of gutter and downpipe options available, as some have more longevity than others, and now may be the best time to pay for that upgrade in order to ensure many years of gutter health to come. Does the roofing repair contractor you’re looking at have their own insurance? Since work is being carried out on your property, it’s vitally important that any contractor working on your home has their own insurance in place, including public liability insurance and worker’s compensation. Any subcontractor who they bring on to assist with the work must be covered by their company’s insurance. If not, you risk exposing yourself and your assets, should anything go wrongdoing the roof repair and gutter repair process. Can the contractor prove their experience and expertise? There are many people who believe becoming a roof repair contractor is as simple as placing an ad on Gumtree and waiting for the inquiries to flood in. However, as with any other part of your home, you don’t want to trust something so important to someone who’s never touched a gutter before! It’s standard for companies to have testimonials of happy customers, so ask if there’s a customer or two you can reach out to directly with any questions you may have about the contractor’s reliability and level of service. Does the contractor have the right tools? When you’re first getting a quote in place for the work to be done, ask the contractor how they plan on approaching the work and what exactly needs to take place. This allows you to gain an insight into the process they will follow and to understand the quote in detail as to what is required for each element of the job. As well, this means the contractor will need to confirm they have everything that’s required for the task at hand, especially if your gutters or down pipes are particularly hard to reach and will require an extensive setup in order for the contractor to be safe while working. It’s best to have this conversation ahead of time, so you’re also aware of the access they will require to your home and can prepare before the date of work for any changes that need to be made outside in order for the contractor to set their equipment up in the optimised space for the work required. If your home is particularly old, or even heritage listed as some homes in Sydney can be, it’s of vital importance to understand how the roof repair contractor will go about the treatment of your gutters in a way that protects the integral structural fundamentals of your original gutters. If changes need to be made and it’s found your gutters require replacing, your roof repair professional will be able to advise on how best to do so in a manner that will fit in with the original architecture. If you do have an old home with beautiful and original design features, it’s of vital importance that you make an extra effort to check the health of your roof and gutters regularly, so you have the best chance of keeping the original architecture and design features in place. It may pay off to find a contractor who you can strike up an ongoing relationship with who can become familiar with your particular home and its roofing specifics. That way, when they’re returning for their annual check, they’ll already be familiar with how your gutters and roof were faring from their last review and will be able to spot problems that have developed through that time with a deeper understanding of when exactly they began to emerge. At the end of the day, looking after your gutters and down pipes is a major part of making sure the home you love is kept safe, functional and happy. After all, it’s literally the roof over your head – it pays off to ensure it’s a roof that can support you and your family! Spend the time and make the investment into its health to ensure any damage is addressed as soon as possible, and reduce the risk of small damages growing into larger problems over the course of time. By engaging the services of a great Sydney roof repair professional, you’ll be able to trust in a job well done.